Heat the oil in a large non-stick frying pan over medium heat. Add the garlic, salt and pepper and cook for 1 minute. Add the peas and crème fraîche, bring to a simmer and cook for 2 minutes. 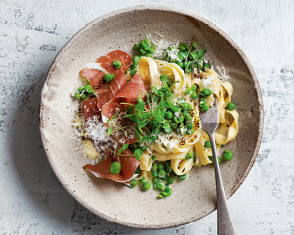 While the peas are cooking, cook the pasta in a large saucepan of salted boiling water for 3 minutes or until al dente. Drain, reserving ½ cup (125ml) of the cooking water. Add the reserved cooking water to the pea mixture and lightly crush the peas. Add the pasta and toss to combine. 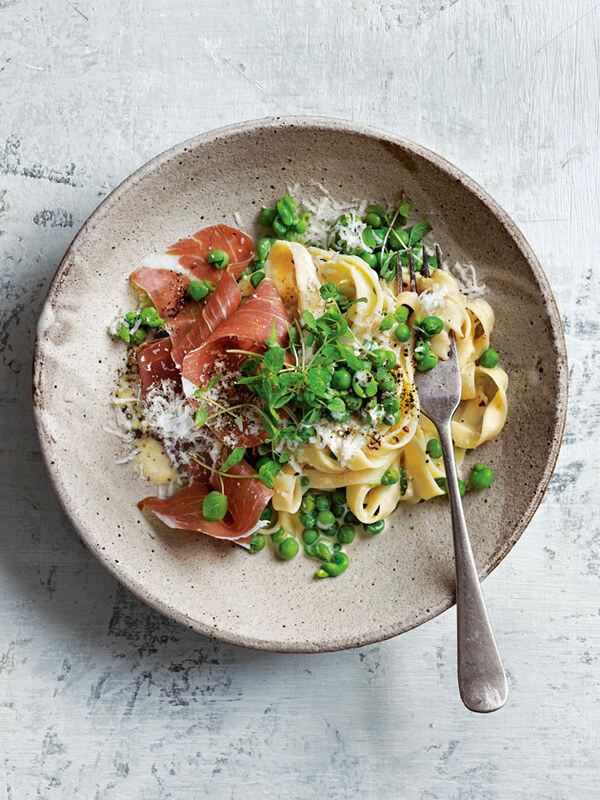 Top with the prosciutto, mint (if using), parmesan and pepper to serve. Serves 4. Cook’s note: We used fresh pasta varieties, which are available from selected supermarkets, specialty grocers, delicatessens and online at pastabilities.com.au. If you can’t find fresh flavoured pastas, plain dried varieties also work – follow the cooking times on the packet.